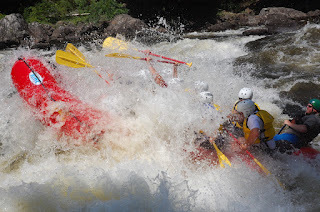 Northeast Whitewater: Moosehead Lake Adventure Destination: Great Start To The Week! On Monday, August 13th, Northeast Guide Service took 37 guests whitewater rafting on the Kennebec River. The weather was nice and sunny with temperature in the mid 70's. The group of 37 was made up of a family of 8 from Vermont, A family of 5 from Maryland, a couple from Connecticut, a couple from New Hampshire, a family of 4 from New Jersey, a family from Harvard, Mass, and a big family from Prince Edward Island. During our lunch, we had the special experience of having a TV show crew stop by and eat with us! Everyone loved our river rice we serve and raved about our brownies we serve for dessert!